The Gold : Silver Ratio represents the number of ounces of silver it takes to purchase one ounce of gold. For example, if gold was trading at £950 and silver was priced at £12.50, the gold : silver ratio would be 76. According to the latest Gold to Silver ratio charts, the amount of silver needed to buy an ounce of gold is at 78.84, but earlier in 2018 we hit a 10 year high of 82.10. Gold per ounce is currently fluctuating around £975-980, while silver is at £12.30 - £12.50 per ounce (31/05/18). The logic is that when the ratio is wider, silver is undervalued, and when the ratio is narrower then gold is undervalued. This is a rough approximation, but investors still use it as jigsaw data - combining it with other factors such as demand and the amount mined. 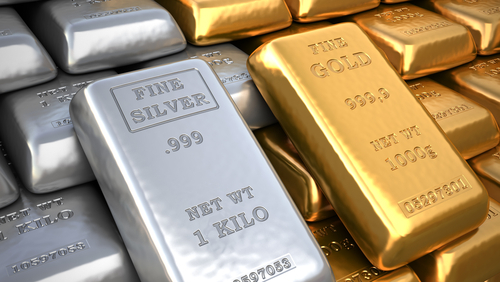 The typical range of gold to silver is between 50 and 70, so the ratio sitting comfortably around the 80 mark suggests the time could be right to buy silver. BBP News: Is now the best time to buy silver in 10 years? Throughout history the ratio has fluctuated widely. Many investors in silver believe the ratio should stand at 16:1, primarily because there is 16 times more silver in the Earth’s crust than gold. Many argue that the ratio could fall further because only 9 times more silver is currently being mined globally than gold. Others point to the fact there is 160,000 tonnes of gold above ground whilst most of the silver ever mined has been used up in industrial processes. View the gold : silver ratio and the silver : gold ratio.